Pink Mimosa my favorite wattle from childhood. It never ceases to amaze me how much Adam and I have in common even though we grew up in different hemispheres. 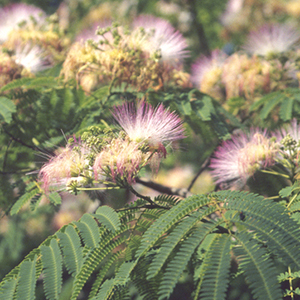 When I grew up in Louisiana, the pink mimosa were always blooming around late May to June right around the time my birthday came along and even until Judy’s birthday which is July 8. Now the pink mimosa that I see around Australia are blooming in late spring to early summer which would be November until January. When I saw the mimosa blooming towards the back of the house we bought in Werrington back in 2005 I knew it was a sign for me. If you are new to following my blog, you will find out that I am a believer of signs. When I first came to Australia, I asked Adam which scent did he love the most. He told me the yellow wattle which is pictured above. 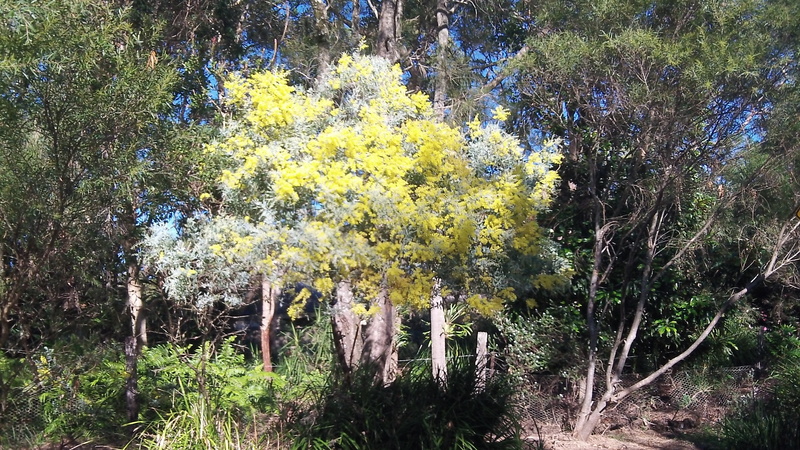 I love the yellow wattle as well. It blooms from June until around August. I always saw it blooming everywhere we went during my first visit to this land I now call home. It tickles me that we both have affection for the wattle. They are related even though it might be somewhat distant and bloom around the time of my birthday even if it’s in different hemispheres. It always brings a smile to my dial when I think of the mimosa and the yellow wattle. The wonder and beauty of nature always astounds me. If I can draw or see a connection, I will be the first to admit it. Perhaps it’s the hopeless romantic in me. There is no shame in admission. Do you have any connections that you make that you take as signs? If so, please share! To say I am floating on cloud 9 is a bit of an understatement. I really can’t go into a lot of details about this but I am really pleased with something that I got to experience with Adam, Lenny, and Guide Dog Instructor Doug Ritchie. In previous posts I have tried to convey how frustrated I have been with Lenny’s dog distraction. 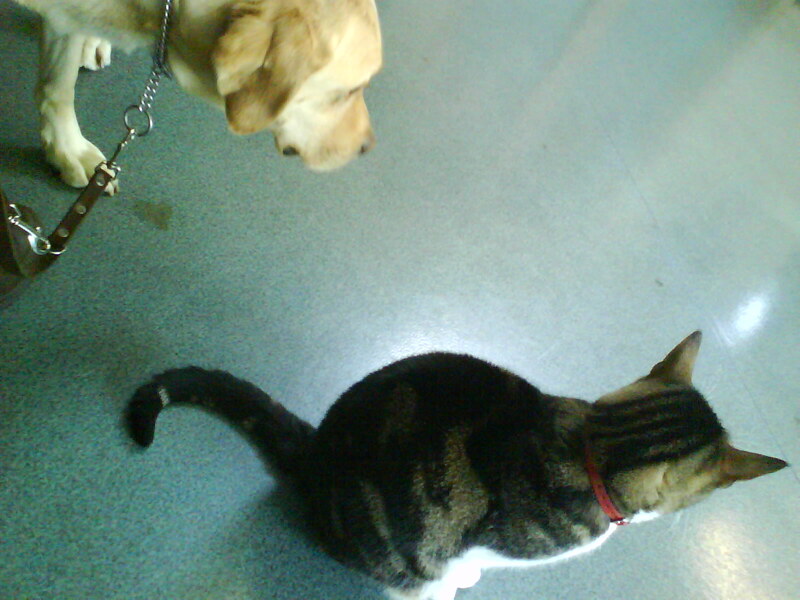 I felt pretty inept about trying to help both my hubby and his guide dog in these sorts of situations. Today though, I feel so empowered. It wasn’t anything earth shattering but Doug gave me some great tools to help my hubby and Lenny work together better as a team. It’s still a long road ahead for them. I am sure though if we all work as a team that we will be victorious. You can learn so much sometimes just through the power of observation. It was terrific getting feedback from an expert. We aren’t sure if this will cure Lenny with his dog distraction but I feel better equipped when we come across the situation. I am sure that Adam in time will also feel more in control of the situation as we all use techniques that were shown to us. We won’t be able to walk all the dogs together because it will make another dynamic for Lenny. Until we have a better idea of how to help Lenny and ourselves cope with the dogs, Mitch and Grady will have to be walked separately. I am also toying with the idea of trying some of the techniques on our own pets for behaviours that I want to instill in them. I think I will get more fit from all the walking we will be doing which is a great added bonus. It’s going to be very interesting. I always think to myself that sometimes it’s the little things that makes me the most happy. Today it was a little thing that made me feel empowered. I hope that you will find a little something that will empower you as well. I will keep you updated through the blog about the dog distraction results as we progress. Once Adam and I moved from Homebush to Werrington I asked him about getting a dog. We had a lovely backyard. I have always loved animals but dogs just warm my heart. Before we left Homebush, we both thought it unfair to have a dog living in a unit but a house, that was a different kettle of fish. We also wanted to get a dog from a rescue place so we decided to go to Animal Welfare League to find a dog whom we both could love. 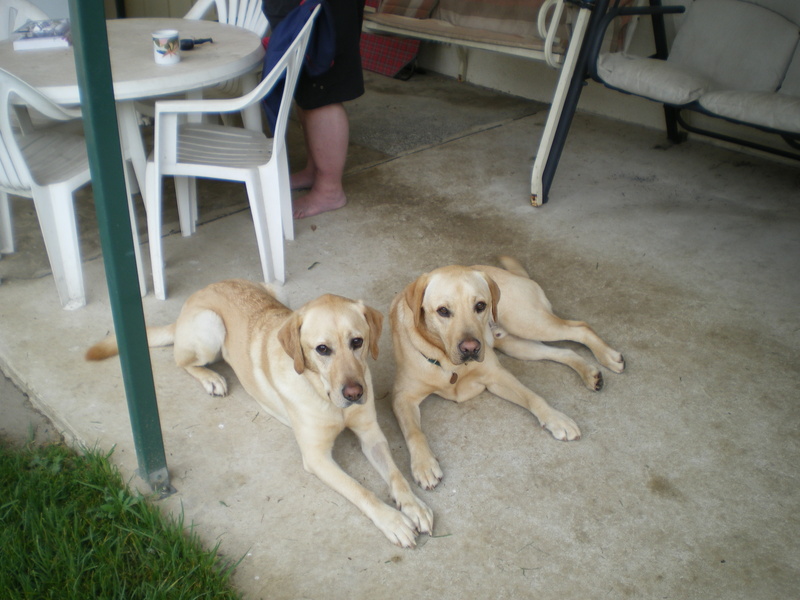 We were shown 3 dogs because I wanted to get a labrador if possible. The first dog was a boxer. I wasn’t keen on a boxer especially when I heard how energetic they could be. I had a labrador before and knew they had a very gentle nature. They loved walking and could sleep for hours if left to their own devices. There were two lab mixes there. 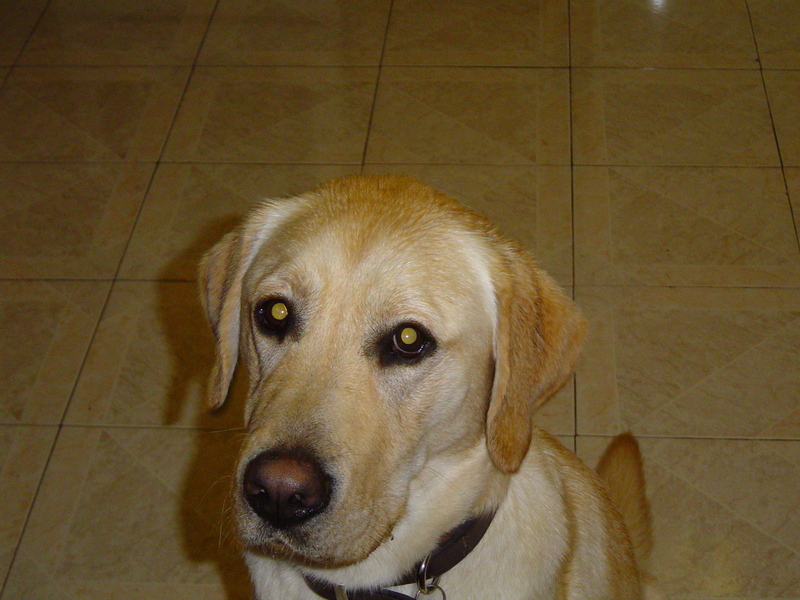 An older female who was black and a yellow lab named Mitch. Mitch was young about 2 years old. He wasn’t desexed yet. One of the conditions of adopting him was that he would have to be neutered. I kept looking at the black lab but really wanted to get Mitch. Wicca was a nice enough dog but I wanted a young dog with energy. He was quite skinny but I knew with my love, he’d be thriving. I didn’t say anything to Adam until we were alone with Wicca. He thought I wanted Wicca but when I disclosed I really wanted Mitch, he was happy. We went back into the office to let them know our decision. The lady at the front desk was really pushing for the boxer but I assured them I wanted Mitch. We had to answer tons of questions. Did we have children? Were there other dogs at home? My answer was simple. We have no children and no dogs. We wanted Mitch and were more than happy for him to be neutered. I was more than happy to take that yellow lab home with me but we had to wait for him to be desexed as well as pay for him to be registered in our council. The following day, I was called by Animal Welfare again to make sure that we hadn’t changed our mind. I was told that Mitch was very playful. He was also a wanderer. He would not be suitable for children or socializing with other dogs by their animal behaviorist. I reassured them there was nothing to be afraid of because we had no other dogs and we had no children for him to play with. The day came when we got to pick him up. I was given instruction on what sort of behaviour to expect from him since his hormones were raging. It’d be about a month for him to settle down. I was fine with that. We put him in the Daewoo happy to take our fur ball home. 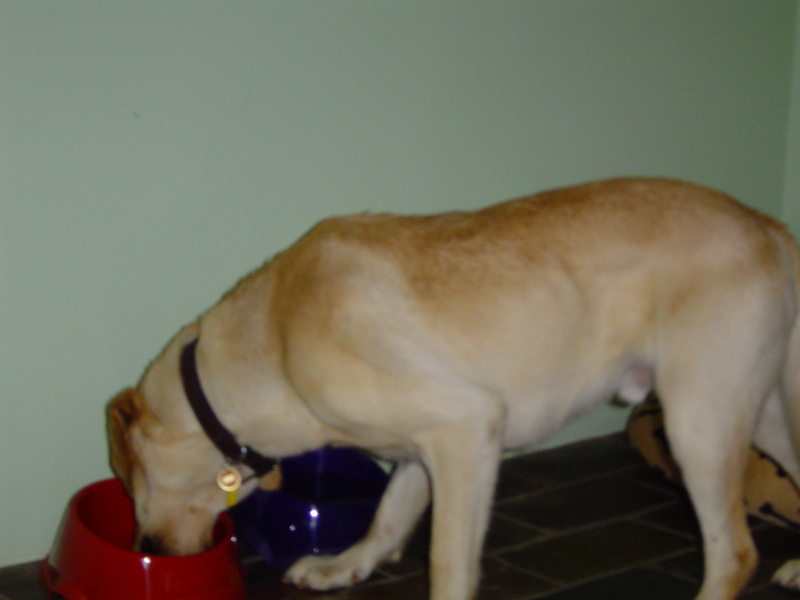 As you can see he was very skinny but with in a few weeks of my indulgence, he looked like this! Mitch has always been a pulling sort of dog on walks. I have taken him to get training to help with the pulling as well as a dog trainer for myself so that I can better manage him on walks. I now use a haltie on walks with him because if he’s not tired, he will literally pull my arm out of socket. I knew something was wrong with him when he had gotten lethargic and would let me walk him easily. I took him to a vet when I thought he had eaten a poisoned mouse. I saw a tail in the bathroom after we had the exterminator come in and put down baits to kill mice. He also loves to chase cats. Could you imagine my surprise when he reacted to Claudia the cat coming up to him without so much as a bark? Here’s the proof! It turns out Mitch had a bad case of bait poisoning and was placed on Vitamin K! He mended but then figured out how to get under the house and baited himself again! Another huge vet bill paid for Vitamin K. We also made sure to put a lock on the manholes to keep Mitch away from the baits. If mice want to live with us now, I will let them be or try to catch them in a more human manner because the way they die by being baited is horrible! I hope we never have to go through that again with him. 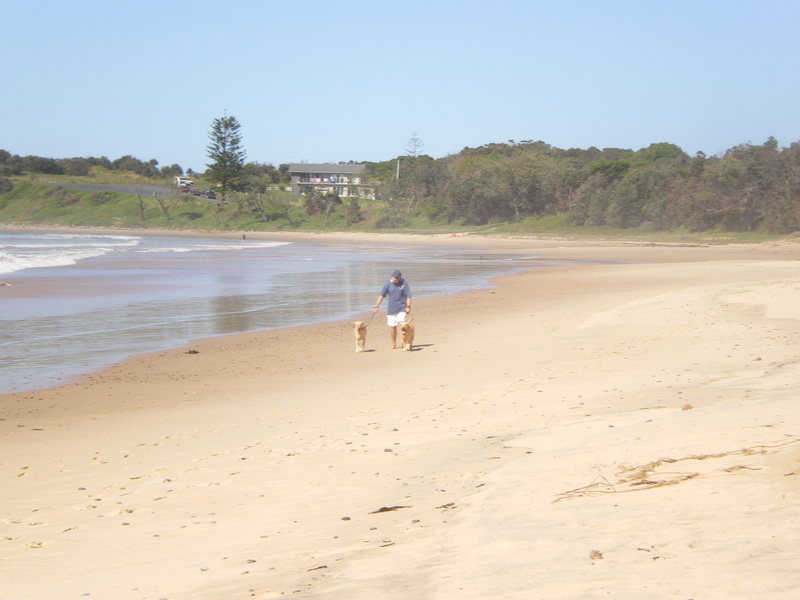 We even took Mitch us on vacation to Coffs Harbour! 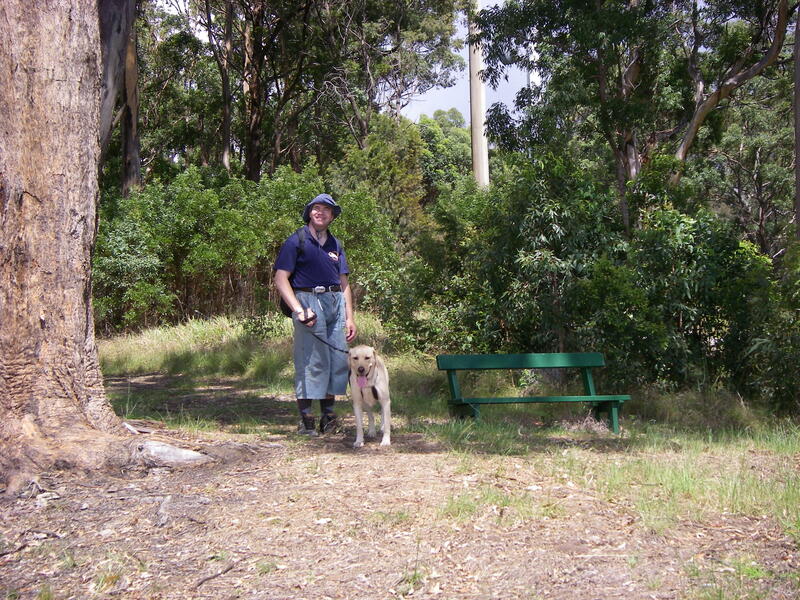 Here’s a happy snap of him and Adam close to Sealy Lookout before it’s renovation! After having Mitch for about a year, I asked Adam about getting another dog because I thought he might be lonely. Adam’s response was a resounding no because he wanted to get a guide dog. I was really thrilled for Adam. I never thought he was going to make that statement. This man who I love is ever independent. He use to say that a cane was much easier than a dog to use. It was less fussy as well as cleaner to deal with. You could leave the mobility cane in the corner. You didn’t have to feed it. It was always at the ready. You didn’t have to potty the cane. 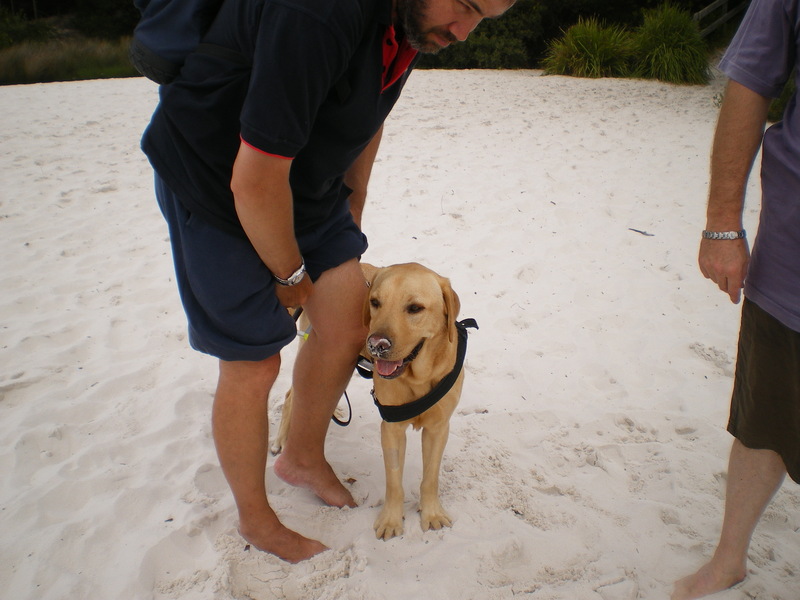 I will blog another time about Adam and his guide dog, Lenny. I often muse to myself that it was Mitch who turned Adam’s thinking around. Mitch who was/is ever fun-loving, eager to go walking or play. Yes, dogs can be lots of work but they can be so loyal. Mitch whines when he sees other dogs. Some may think it’s because he’s scared but I know him better than that. He wants to go greet and meet. He is ever eager to run, smell, and play with another dog. Mitch loves to go for a wander. There are times when I let him off lead when I think it’s ok especially in the bush where we live here. He hasn’t been out and about due to the stitches he got from the kangaroo he terrorized with the youngest of the Morris pack but he wants to go all the time. Nothing slows him down. He loves being an escape artist. We had to get better gates at Werrington thanks to his ingenuity. We didn’t have him a week before he wander away and I paid a reward of $50 for his return. Even at our latest house in paradise in the mid north coast of NSW we had to doctor the fence a bit because if there is any way that a dog can get out, Mitch is the dog who can do it. He’s getting older now but he’s not slowing down. He can keep up with Grady who will turn 3 in June. He can be oh so gentle. He’s my Mitchy Mitch,my Mitchy Moo, Mooney booney, the Mitchiest Mitch of Mitches. I love him and am so glad he’s my dog. When I first got him, I thought how the hell am I going to put up with this yellow fur ball who can tear up swings with gusto. He’s mellowing with age but he’s always going to have a special place in my heart. 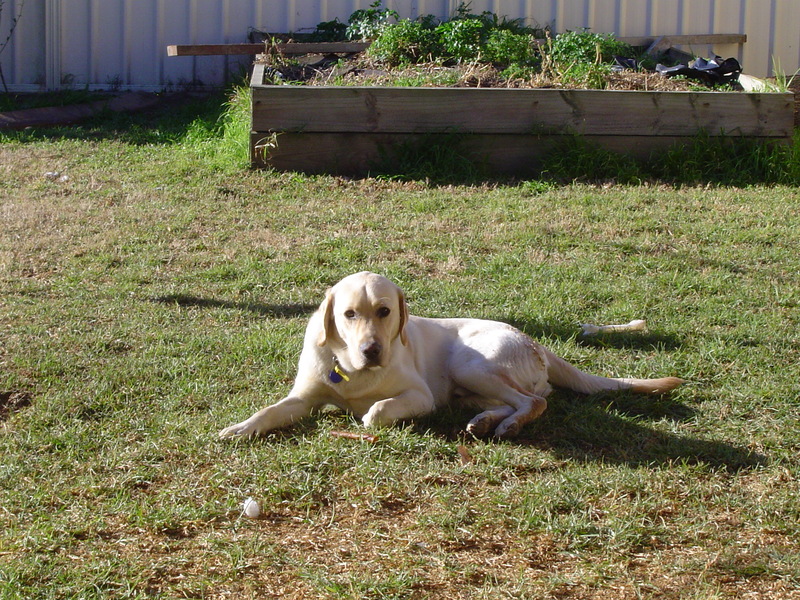 He’s my first Australian dog who helped Adam and I become a family. I also think he helped Adam realize that having a guide dog wasn’t such a bad idea at all. I’d love to hear about others first dogs if you want to share! Please be my guest! I’ll leave with you another pic of Mitch and Lenny not long after Lenny joined our pack! Happy Joy Joy Crap crap crap! Today I just don’t really know what to blog about. I know I should finish up the Kimberley, Western Australia trip. I have way too many thoughts and trying to pinpoint something in particular is like trying to keep my dogs still when they want to go play even while they are stitched up. I try to write interesting things when I blog but sometimes I just think it’s total crap so I don’t post. I want to be witty and funny but these past two days I haven’t been feeling that way at all. It’s hard to be witty and funny all the time. There are days when you just want to do that but you feel totally inept. I am in one of those moods today. I spoke with a fellow blogger and he has helped me feel a bit better. He has really bad days but he’s a fighter. I may not have all the huge challenges that some people have but I try to deal with my own little crisis to the best of my ability. When I was younger, I loved the Police. (I still do love the Police). In fact, my favorite song that I love to listen to when I get in one of these moods just happens to be “Too Much Information”. Adam even bought me “Ghosts In The Machine” a few Christmas’ ago because I was telling him that was the first album I ever got. All the tracks are superb but “Too Much Information” is a real standout, especially when I get in one of my funky moods. I always turn to that song when I am worked up. I know I shouldn’t expect to always write upbeat stuff but the world can be full of bitterness. I don’t want to add to the crap yet the fact remains I can’t always be in a happy joy joy state. There will be times when I feel like crap. I know God is there with me. I don’t feel like quoting scriptures. I am totally blessed. The fact remains that there are days when I struggle with staying in a happy joy joy state. It’s only natural so I better cut myself some slack and keep listening to “Too Much Information” to help my crap crap mood. Prayingforoneday thanks for all the moral support. You are much appreciated! I love ya mate! I’ll keep on keeping on like you do! Another great Aussie saying will work for me too. “She’ll be alright mate!” This shelia most certainly will! Peace and thanks for reading!